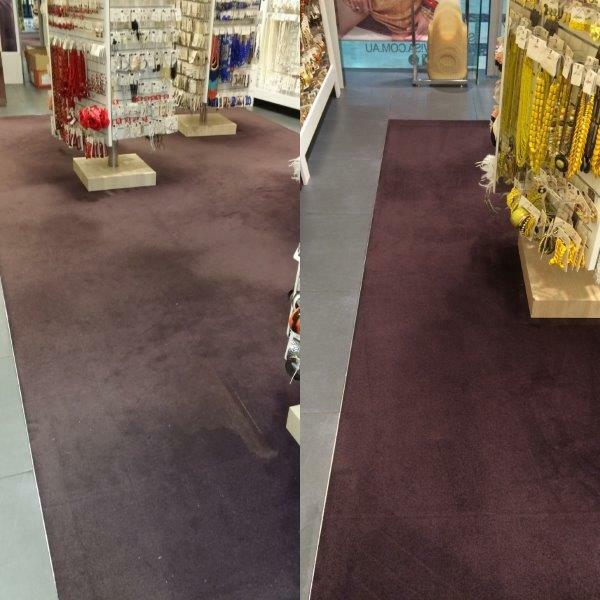 Commercial carpet cleaning Melbourne and suburbs by our fully trained and qualified technicians. We can clean the soft furnishings in all manner of commercial premises, from offices to shops, hotels, restaurants, schools and clubs. Regular carpet cleaning will not only keep your work space looking good, but also helps prolong the life of your carpet. First impressions count as they say! Providing a clean, well maintained environment for you customers is a great start. Call us for a quote or to arrange an inspection! In most cases, we can quote over the phone, however we can inspect your property before quoting, if your prefer. This is a free service. When quoting, we consider many factors such as, the age and condition of the carpet, the amount of foot traffic, stains or damage, and the overall size of the area to be cleaned. Our commercial carpet cleaning rates are charged by the SQM. Once you accept the quote and arrange a booking, we will do a walk through with you to determine the best method of carpet cleaning for your premises. Generally, steam cleaning is the best method for commercial carpet cleaning in Melbourne, as the volume of traffic means carpets require deep cleaning. We always pre-spray and use a spot treatment. If carpets are heavily soiled,they may require rotary agitation, to ensure soil is loosened from the carpet fibre, . Then, we steam clean carpets and extract the dirt. All of our detergents are environmentally friendly and deodourising is always free for Melbourne commercial carpet cleaning clients. We also professionally clean fabric and leather upholstery including office chairs, sofas, cinema seats and bus upholstery. It is easy to overlook upholstery cleaning in commercial operations. You should have your upholstery professionally cleaned to prevent the build up of dirt, odours, dust mites and allergens. Regular cleaning will also extend the life of commercial upholstery. Nuline, currently contract us to clean the upholstered seats on all Nuline Charter coaches. k you to all our valued Commercial Carpet Cleaning Melbourne Customers! Some of our customers include Lovissa, Nuline Charter, Parkglen, Victoria By The Park, Ormond Community Kinder, St Patrick’s Primary, Murrumbeena, Sage Institute Elsternwick, Core Physio Elsternwick, Damm Fine Foods, McKinnon Smash Repairs, Merricote Northcote and Prahran Mission, Caulfield Bears Football Club, Carnegie Cricket Club, Glen Eira Soccer Club. Our small business carpet cleaning rates are very competitive and we are happy to arrange after hours bookings to accommodate. Please contact us to arrange a free quote.